We have already acquainted you with the books that are worth to read a person aspiring to success. Of course, there are many books in the world, which can flip your mind and push you to make the first step into a new life. 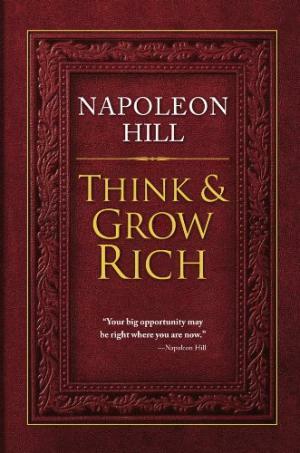 “Think and Grow rich” by Napoleon Hill is one of those books and we insist that this is the best self help book any entrepreneur could ever read. Perhaps the only one they need to. Napoleon Hill was tasked by Andrew Carnegie to write a book on what made a successful person succeed, and he spent 20 years researching and interviewing every great name of the day (Ford, Woolworth, Edison, etc), plus lots of people who failed (because you have to know what doesn't work too). As a result, in 1937 the world saw the book "Think and Grow Rich", which to this day is in the top 10 of the best business bestsellers. Find something you love to do. You have to love what you are doing; you have to be anxious to go to work in the morning. Until you find something that you really love to do, you are probably not going to be successful because just making money doesn't make you successful. Develop a plan of action. Developing a plan takes more than just thinking. You have to take action, too. Hill says you may not have all the details figured out in the beginning, but forming a plan is a good start. You can always alter your plan later on, he adds. Involve other people. Hill states that in addition to finding something we are passionate about, we need to align ourselves with other people to accomplish our goals. No matter how smart we are, we need others because we can't know everything about a particular thing. Don't forget to give back. The more success you have, the more you are in a position to give back and make a difference in the lives of others is the philosophy that I have imbibed by reading this book. Most people who have been successful are very willing to help someone else achieve their own goals. We wish to state here the insights we've gained in reading this book, but we think it will deprive you of the fascination of knowing these things first hand. We envy you the journey of truly knowing yourself. Remember it's not the destination that matters, but how you've come to enjoy the journey and made the most out of it!